A funny thing we learned about technical furniture was how dissatisfied IT people are with computer manufacturer cabinet offerings. 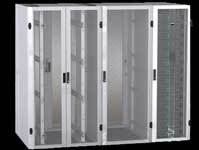 Having seen many IT manufacturer cabinets over the years at data centers we assumed people were satisfied. Then we started asking how they like them and wow! We found out most hated them, they just were convenient to order. We have worked with SMC/e-Systems for years and they design and manufacture server cabinets and consoles that are extremely well thought out and universal in application. As engineers we're particular towards designs that allow airflow to get out of the cabinet and where cabling does not interfere with access. The cabinets we offer include flexibility that properly serves the IT equipment and they look great. 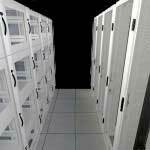 Their universal application design allows any manufacturer's equipment to be housed bringing uniformity to the IT room. And we've learned we often can satisfy client needs with this higher quality at lower cost! Pictured above on the left is a line up of three server cabinets with a wide Network Cabinet, a 30" wide Blade Cabinet and a traditional 24" wide standard server cabinet. On the right is a picture of our colocation version which allows subdived compartments within each enclosure. Designed as the standard for high density computing with extensive cabling and CPDU capacity. 19 or 23" rail spacing to accommodate network, server and storage equipment or 23" telecommunications equipment. Designed and engineered specialty cabinet for compliance and unique mounting requirements of industry leading switch appliances and gear. Can be configured for side to side airflow while accommodating hot - cold aisle concepts.